This meal is great because it balances a perfectly pan-fried chicken cutlet with a really delicate salad, which in my opinion creates a perfect combination. The cutlet has lemon zest in the breadcrumbs and lemon juice squirted over it after frying, which gives it an amazing and unexpected layer of flavor. The salad is just three ingredients (watercress leaves, flat leaf parsley and radishes) and is topped with an insanely delicious homemade buttermilk dressing that can be served to the side or right on top of the chicken. The best part of this dish is that you make your own cutlets, which ensures you’ll get the most bang for your buck! Start by making the buttermilk dressing. In a medium bowl, whisk together 1 cup whole milk and the juice of 1/2 lemon. Let it stand until the milk thickens (about 5 minutes). Add in zest of 1/2 lemon, 5 tbsp mayonnaise, 1/2 finely minced shallot, 1 1/2 tsp chopped fresh thyme, 1 1/2 tsp coarse salt and 1/2 tsp fresh ground pepper. Whisk, cover with plastic wrap and refrigerate until ready to use. 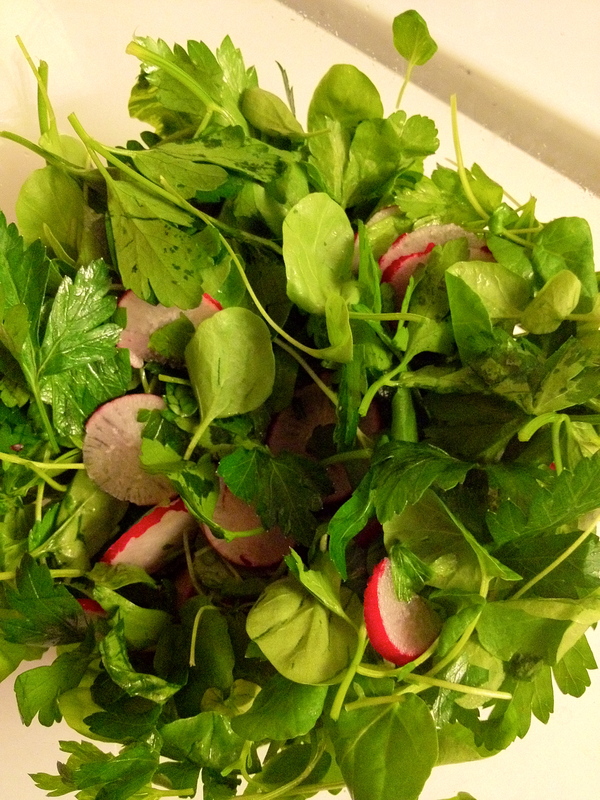 Make your salad by combining 1 bunch of watercress leaves, 1 bunch of flat-leaf parsley leaves and one bunch thinly sliced radishes in a large bowl. Refrigerate until ready to use. 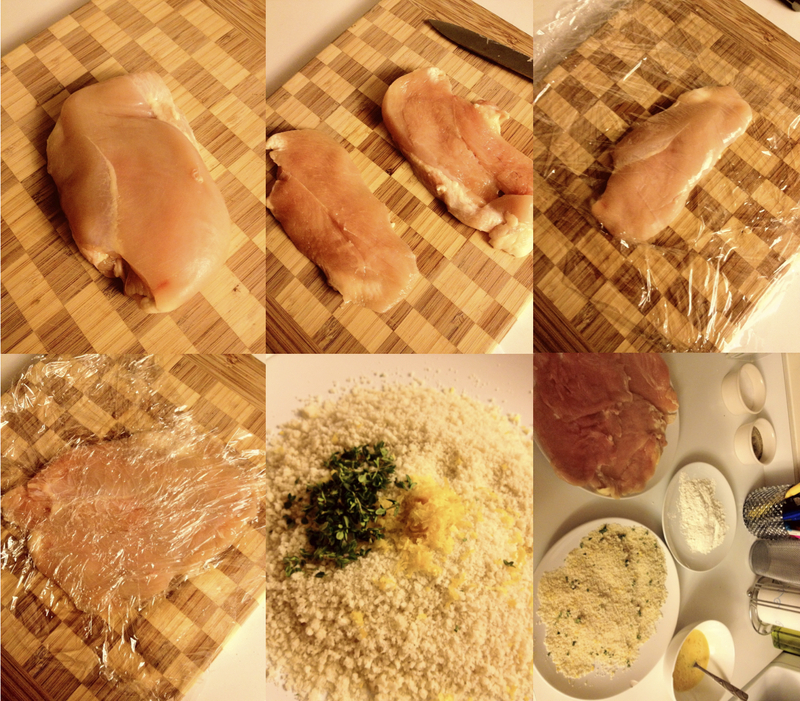 Take 2 chicken breasts (about 8 ounces each) and make them into cutlets: Cut them in half horizontally and then pound them out using a meat mallet or cover them with plastic wrap and use the bottom of a cast iron skillet. You should now have 4 cutlets. On a large plate, combine 2 cups panko bread crumbs, the zest of 1/2 lemon, and 1 1/2 tsp fresh chopped thyme. Set up a breading station: One plate all-purpose flour, one bowl with 2 lightly beaten eggs and the last plate being your seasoned panko. In a high sided skillet heat enough vegetable oil to come about 1/2 way up the side over medium high heat. Once your oil is hot, gently place one cutlet in the pan. Fry on one side until golden brown (about 2-3 minutes) , flip over and fry until golden brown also (about another 2 minutes). Remove from the pan and place on a drying rack set over a baking sheet. Squirt with fresh lemon juice. Repeat with all the cutlets. 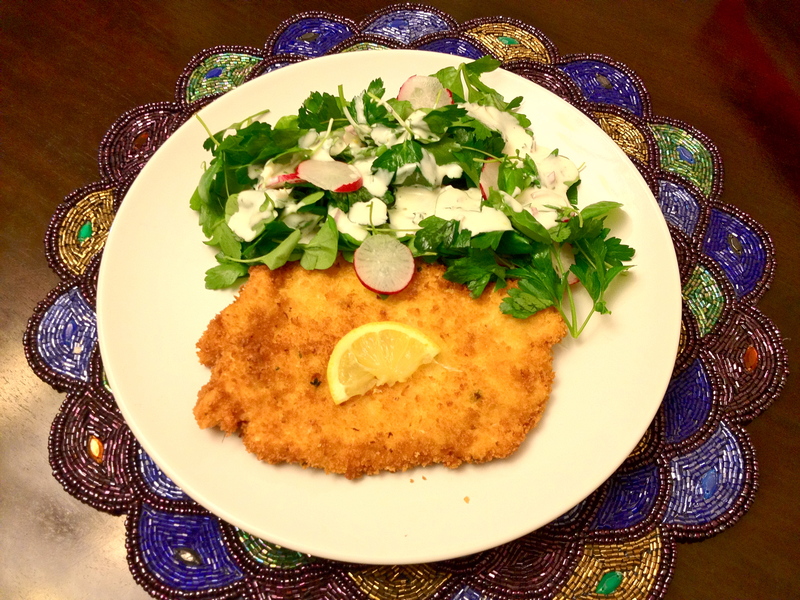 To plate, place a cutlet down and add the salad and dressing either on the side or directly on top of the cutlet. That’s how my grandma makes it!